Mark Yeboah-Agyepong is the Founder and Centre Director of TriMark Aquaculture Centre (TAC). He graduated from Kwame Nkrumah University of Science and Technology (KNUST) with Masters of Philosophy Parasitology (2014), Bachelor of Science Natural Resources Management (2010), and Diploma Natural Resources Management (2003). He began by conducting feasibility studies on nutrient recovery from communal wastewater (black, grey and kitchen spent water sources) for commercial fish production in Ghana since 2010 till date. 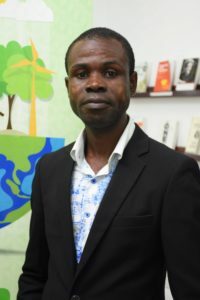 He worked for Waste Enterprisers, KNUST and International Water Management Institute in different capacities such as Aquaculture Production Manager; Teaching/Research Assistant and Contract Researcher respectively. Mark is presently providing oversight responsibility at TAC to run a pilot business model in recycling wastewater for fish production in Kumasi, Ghana. In most urban cities, domestic wastewater especially black and greywaters are discharged into the environment untreated. This wastewater ends up contaminating surface waters and underground water sources. Trimark Aquaculture Centre, seeks to solve this problem by recovering nutrients from the wastewater for fish culture and revenue from the fish is ploughed back into the business to address the shortage of funds in the sanitation value chain. The short term plan of TAC is to embark on full-scale commercial production (6,000kg/year) of the fish and after which the business model could be replicated in other potential sites in Ghana and other African countries to sustainably address sanitation.